How to Detect Facebook Unfollowers: You may be a bit curious to know your Facebook friends that unfriended you because you noticed a drop in the numbers of Facebook friend. Facebook does not have a feature that displays the list of those that unfriend you on its platform due to the fact that it may cause negative user experiences. However, there is a third-party app created for this purpose, it is a free app for iOS and Android devices, it is also a browser extension for Google chrome. The app is called "Who Deleted Me". It works by simply saving a copy of your friend list after you first use Who Deleted Me. 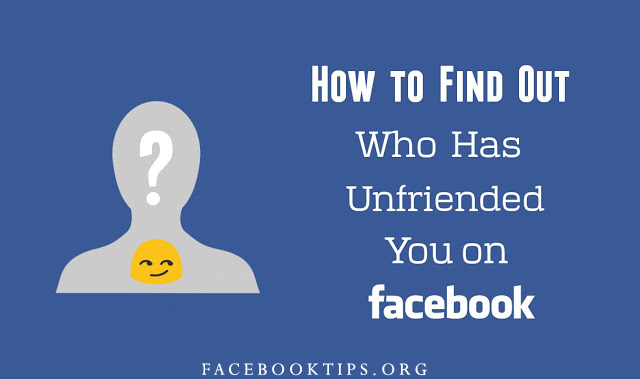 It provides a list of who stopped being your friend on Facebook as well as any new friends since the last time you were logged on. Both the app and the browser extension will identify whether you were the one to delete a friend and whether someone merely deactivated their Facebook profile. To install the Who Deleted Me Google Chrome extension or see how it works, visit the website here.